Autumn/Fall is my favorite time. The temperatures are cooling down (well, usually but not this year) the trees are sporting beautiful leaves in glorious colors. I was at my local Scrapbook store... you know, Paradise Scrapbook Boutique, and Karen just received a new line of Graphic45 papers. I found one with lots of graphics and decided to cut one and frame the pieces. So that's my focal graphic. 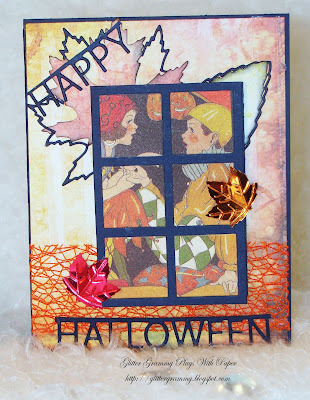 Then, I added my favorite Poppystamps leaf dies, see them peeking out from behind the graphic? 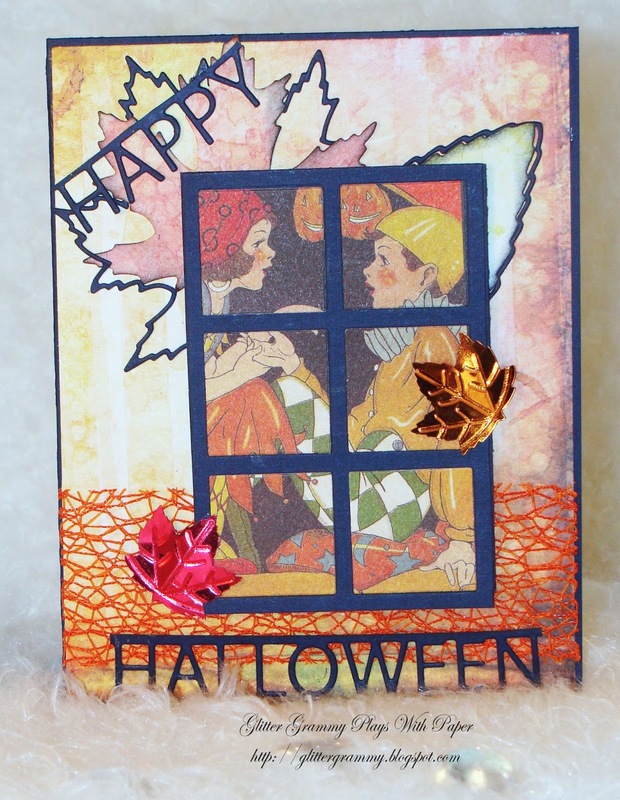 And I needed to say Happy Halloween, so I used a Memory Box Border, which I cut to fit the 1/4 fold card. I added some ribbon a bit of leaf confetti and the outside is done! And the inside could not have been easier. My buddy Mary Jane gifted me some 6x6 paper, which is what I used for the background both on the front and inside. 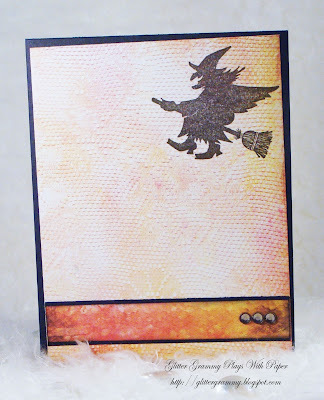 A little rubber stamp witch and some bling and the inside is complete. I love the monthly challenges and I think you will love playing along. You could win a super prize, so, how about joining in. It's easy! Check out how: Right Here! For a bit of inspiration and the rules check out what the Design Team has created. Hi Mary, Lovely card. 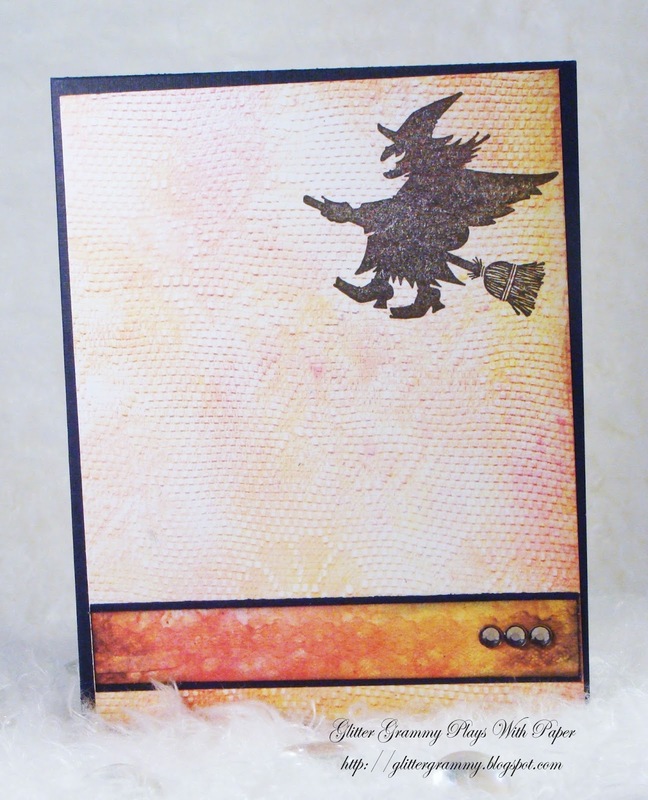 I like the gold leaf on the front, it really picks the card up. I need to get a wiggle on if i am going to get mine done too!